The Liberal Party are composed almost entirely of lawyers. You could call it a 'cabal'. The Australian public have finally realised the cabal has no basic concept of reality and responds in an ad-hoc and reactive manner. The heart of an Australian lawyers' education is the maintenance of a colonial hereditary monarchy. Added-on are the contradictory ideas of 'equal opportunity', 'anti-discrimination' and freedom of speech and religion. As a result of their illogical training, an Australian lawyer believes in the intellectual equivalent of the Easter Bunny. They cannot tolerate critical analysis because they know they are just intellectual frauds. A Liberal Lawyers thinking is based-on layers of 'privilege and entitlement' rather than layers of 'cause and effect'. No wonder they are a hilarious but devastating train wreck in slow motion? 1. Neville Smith Forest Products (NSFP) sells a woodchip loading facility to a Cayman Islands-registered shelf company (RFF) so NSFP can build another woodchip loading facility, only to be blocked by an industrial fish farming company. The Liberals thought this was an issue for the companies to sort-out. They couldn't. We predict questionable FSC certification company Global-Mark will transfer the Smartfibre controlled wood certificates to both NSFP and RFF. 2. Hodgman funds Hermal Group to manufacture CLTP (cross laminated timber panels) from Forico's pulp wood plantations. Premier Hodgman gave wealthy Victorian Ron Goldschlager $13 million and a $30 million loan to kick off the project. Remember, Forico's 'genetically enhanced' nitens were developed over a 20 year period specifically to make paper. Nobody has ever made CLTP from pulpwood trees. 3 months later, the Tasmanian Liberal Cartel got UTAS (University of Tasmania) to issue a research grant to see if it's possible to make CLTP from pulpwood. Will Hodgman handed over $43 million before knowing if pulpwood trees can make CLTP. The above screengrab is from the semi-literate UTAS research proposal. And UTAS is an institution of higher learning WTF? WHY DOESN'T RON GOLDSCHLAGER MAKE PANELS FROM RECYCLED PAPER OR IS THAT TOO MUCH IN THE NATIONAL INTEREST? 3. Realising they can't export woodchips from anywhere in Southern Tasmania, the Liberal Lawyers hire Evan Rolley, alleged Labor head of Paul Lennons office, ex-CEO of Forestry Tasmania and accomplished forestry pyrotechnics expert. Rolley is also alleged to have bought Ta Ann to Tasmania, after studying with Hamed Sepawi at the ANU in 1974. A month has passed and no Southern woodchip port is announced. Maybe Rolley will never announce it? One thing that ties Barnett and Rolley is their love of secrecy. Rolley has had TV docos suppressed and Barnett would sell the whole of Tasmania to China if he thought nobody was watching. 4. Liberals award a lucrative contract to a company that does not exist, which then goes broke. 'Majestic Timbers' was not even registered with ASIC when is supposedly won a 'contract' to export timber and woodchips in containers. Now their phone is disconnected and their staff are unpaid. 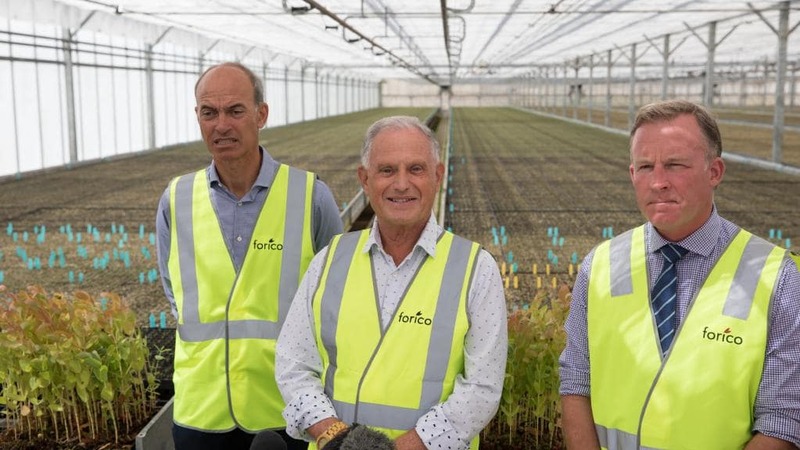 Guy Barnett (who looks like he is experiencing deep existential pain) was so impressed by Rolley he hires him to the board of 'Private Forests Tasmania' which believe it or not is a government department. (Don't you love living on an island where hardly anyone understands English?) What an excellent appointment, but wouldn't Rolley better serve as 'Special Minister For Denying Forestry Caused Devil Facial Tumor Disease'? This is a theory that won't go away, so who better to manager it than expert in wine, forestry, shipping, dairying and plywood Evan Rolley? Evan Rolley is so talented in so many fields he could be the next Liberal Premier of Tasmania.